Annette Burfoot was named as the Highland Council's Employee of the Year for 2018. Annette Burfoot, who has worked at the island school for 11 years, has also been praised for inspiring pupils to further educate in nutrition and healthy eating habits. Highland Council’s catering services manager Sue Nield said: “Annette’s proactive role within her school is the very heart of what our school meals are all about. Her relationship with staff and children is inspirational. 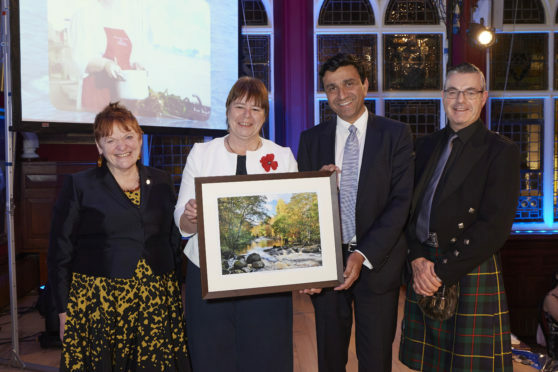 The Broadford cook was presented with the award by Leader of the Highland Council Margaret Davidson and Manish Garg of WIPRO, the IT provider for the local authority, at a ceremony held in Inverness Town House on Thursday evening. Mrs Burfoot was also named as runner-up in the Scottish School Cook of the Year award earlier this year, with all the fresh vegetables, herbs and fruit used in her award-winning dish grown by the pupils at Broadford Primary.